Architectural structures in your community are excellent subjects for children to draw. 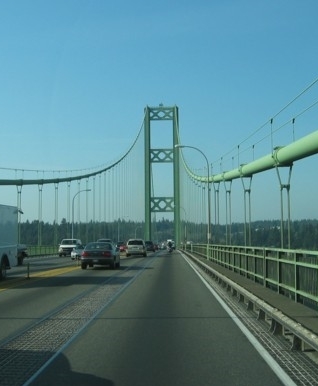 I live near the Tacoma Narrows Bridge in Washington State. In 2007, a new bridge was built alongside it. We watched the new bridge go up and learned about bridge engineering and construction, which of course, led to a drawing lesson. This lesson is NOT in a Draw Write Now book—the children and I were simply drawing our world! 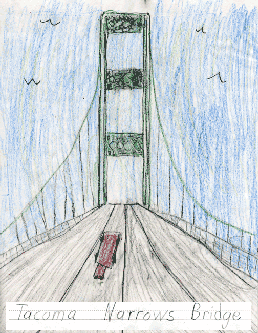 The basic parts of a suspension bridge: towers, main cables, anchorage, suspender cables, road deck. Artistic styles influence engineers as they design a bridge. 1st bridge (1940) video, named Galloping Gertie (don't miss this video—beautifully presented by a high school student) Another video. Bridgemeister.com —See suspension bridges from your neighborhood and from around the world!